prevent you from achieving your true potential! I just put the finishing touches on my new e-book called “Marketing…The Key to Business Success". I would like to offer you the opportunity to download a copy today. There is no catch. Just solid information drawn from my 28 year career as a financial advisor and the thousands of advisors who have learned from my experiences in building a highly successful practice. 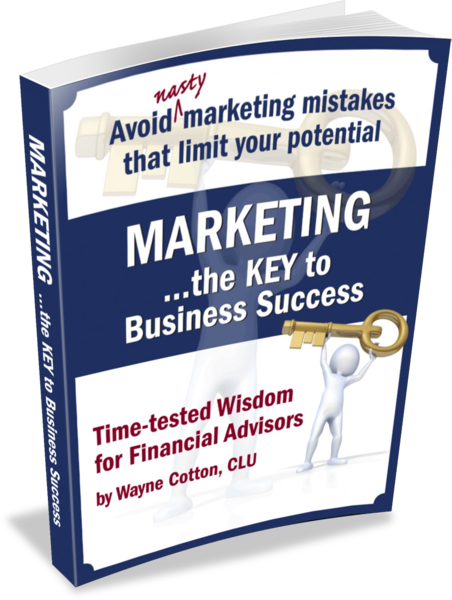 “Marketing... the Key to Business Success” contains 68 pages of core content from my marketing articles. In them, I expose the insane thinking and ineffective marketing methods that can stunt your ability to grow. Of course, I’ll also share some powerful theories and next steps that can impact your growth now and in the future. How would you classify your marketing skills? * Please select oneI have a great marketing program that works for me.I spend too much money for what I get in return.I get leads but not many of the right new clients.Marketing is one of my biggest challenges.This question doesn't apply to me. email to your Primary inbox so going forward Cotton content will land in your main inbox. these emails at any time. I hate spam as much as you do and I will protect your information.